This 100 ft Seagrave Rear-Mounted 4 section aerial is stationed in America's most famous firehouse -- FDNY Fire Station 10. The station is located just 50 meters from what had been the south tower of the World Trade Center. When the south tower collapsed, firefighters, police officers and paramedics sought refuge in Station 10, which was heavily damaged but remained intact. The station which houses both Engine 10 and Ladder 10 was rebuilt by the FDNY in 2003. It is now the most visited tourist attraction at the World Trade Center disaster site. Seagrave, longtime manufacturer of FDNY appliances, delivered this rig with a very special paint scheme -- a hand painted patriotic montage. These days Seagrave builds every pump and aerial device for both the FDNY and the Los Angeles City Fire Department. Those contacts alone keep the company in business. 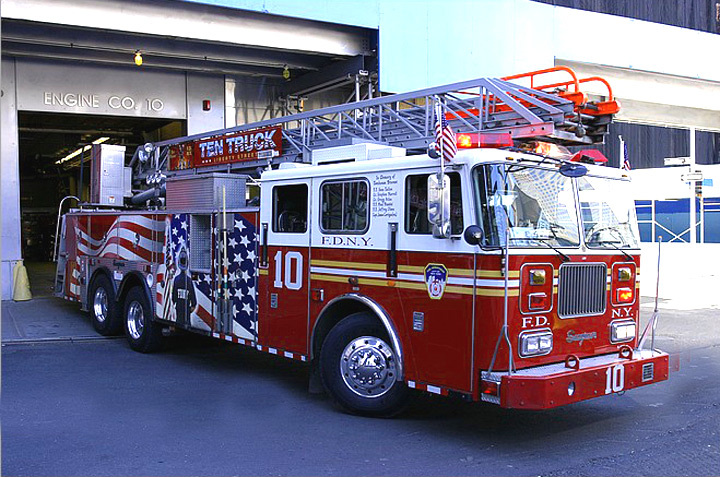 Actually, the current Ladder 10 was manufactured in late 2001 and put into service in early 2002. Added by Konrad Nowak on 28 October 2007. Added by R. Genberg on 23 November 2008. Added by JOHN HOPPER on 23 February 2009.
been having service done, but if seen with a crew then posibly training. a regular basis for ongoing training throughout their service with the FDNY. Added by Pete Matten on 24 February 2009. The newest trucks are not from Seagrave but from Ferrara. Added by Ed on 10 September 2011.